We moved into our new home on Monday 4th January. 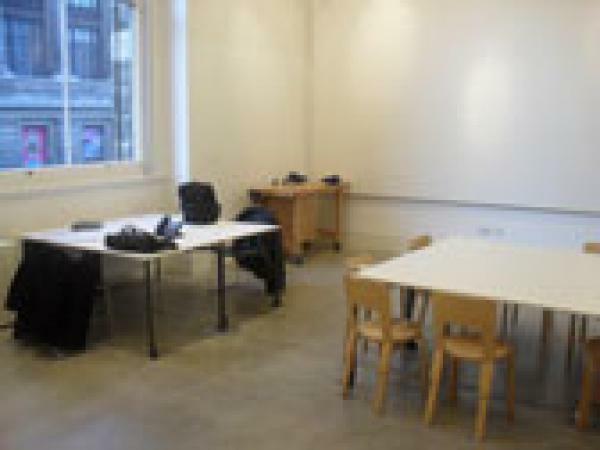 For the next six months, Residency Studio 2, Sackler Centre, V&A Museum, London will be our address, just in case anyone wants to send us a moving in present. The Christmas decorations have already been taken down, which must mean it is time to get down to some serious work. 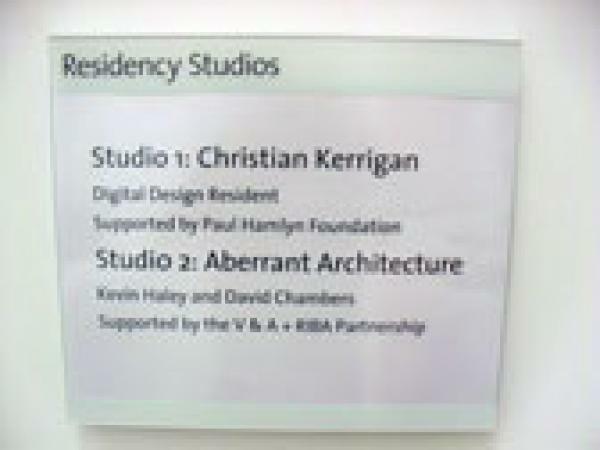 In fact, the studio was completely bare when we moved in. The ceiling is 8-9m high. 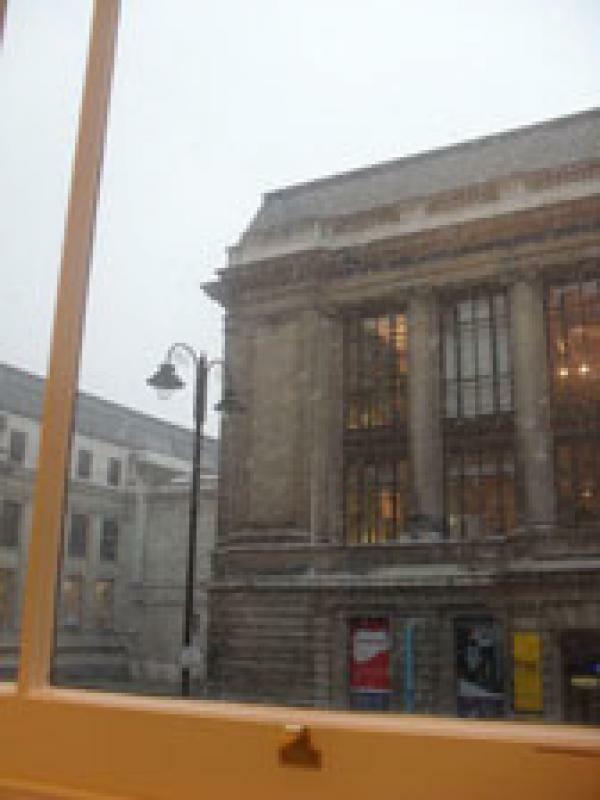 A large window looks out over the snow-covered Science Museum opposite, and we have had to compete with the echoes of our own voices as we shout at each other across the room. A 15th century Moorish-style rug from renaissance Spain would really tie the room together! Saying that, the gallery catalogue says the V&A have one left in the collection. We’ve reserved it so we must pop down the Renaissance and Medieval gallery when we have a minute. Next up, the Thomas Chippendale table and chair set we have on order (subject to approval from the powers that be). For now though, we are amassing a collection of mugs and we have bought a kettle so we’re good to go. Each day we learn something interesting and/or useful about this quirky corner of Albertopolis. The museum employs 750 people who live in a secret world behind the staff doors that is only accessible with a special staff key, which we now have. Apparently there is a gym underneath the dinosaur in the National History Museum that we can join. And as one might expect from an institution with a collection spanning 5000 years of art and culture, the staff canteen does a good full English breakfast for a very reasonable price, which we have already sampled. We will have to wait and see if the draw of the dinosaur gym can outdo discount bacon, sausages and baked beans. On Wednesday some of the staff from the museum came to visit us in our studio for tea and biscuits and on Friday we had a productive conversation with members of RIBA, where the topic of conversation turned to the dying art of drawing in architecture and architectural education that started with Palladio. Lucky Kevin was on hand to reassure RIBA top brass that the tradition is being kept alive by the first year watercolour classes at Ravensbourne College. We have made a very useful contact for our upcoming trip to the Outer Hebrides with our students from London Metropolitan University, and we thoroughly enjoyed 4pm tea and biscuits in the RIBA offices. We regret that everyday won’t be tea and biscuits, or tea and scones or tea and cake, but we will be throwing open the doors of the studio at some point for an afternoon of tea and something, so continue to watch this space. Our first week as the architecture residents ended with a meeting with the illustrator Rosalind Richards and the writer Falcon B Mews, who we are collaborating with on our book of short stories ‘Love Stories of Recession’. The publication date has been set for early next month and we plan to launch it during our first open studio in February.